More Than Sad training programs have taught over a million students and educators how to be smart about mental health. This set contains two DVDs. More Than Sad: Preventing Teen Suicide is intended for educators and other school personnel, and covers mental health conditions, the warning signs of suicide, and the steps we can take to get help for at-risk students. 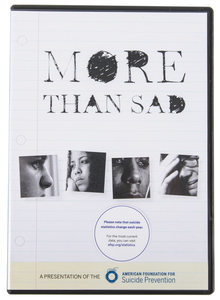 The second DVD, More Than Sad: Teen Depression, is intended for teens, parents, and educators; this film teaches students about depression, demystifies treatment, and encourages students who are struggling to seek help.